Sound "The AIVS fluids produced vinyl that was visually and aurally as clean as it could get, often restoring the inky-black luster of the LPs as well. While the AIVS fluids didn't produce records with greater midrange presence or improved bass definition, as some people inexplicably suggest is possible with certain cleaning fluids, I did think the results were slightly better than with the Walker Prelude system." Features "In addition to separate cleaners for vinyl and shellac records, AIVS has a three-product regimen that uses an enzyme-based fluid, a general cleaning fluid, and a water rinse." Use "I followed the AIVS directions and achieved decent results without a record-cleaning machine.... However, a machine cleaning afterwards always reduced groove noise, ticks and pops. Value "In terms of cost, a 16-ounce kit ($38) should clean around 125 records; you can double that for the 32-ounce kit ($68).... The AIVS fluids are clearly more economical, and you will spend less time using them and more time listening." Having returned to analog playback after a dozen years away, I have relearned a few immutable lessons, including the importance of cleaning LPs -- all LPs, even those that are brand new. The difference between a seemingly clean record and one that's actually clean is dramatic, with noise reduced not only for the first play but subsequent ones as well. Removing as much grunge as possible preserves the sanctity of the groove, so each play is a quieter experience. Anything left in there can become a permanent part of the record, the action of the stylus bonding it to the vinyl like a steamroller does with a stone in asphalt. Many of the newest cleaning products on the market are formulated for cleaning deep into the groove and removing things like mold-release agents and oils from our hands that can be especially difficult to eliminate. Count the Audio Intelligent Vinyl Solutions line of cleaning products among these. It comprises individual cleaners and combinations of cleaners that aim at "removing a wide range of contaminants." 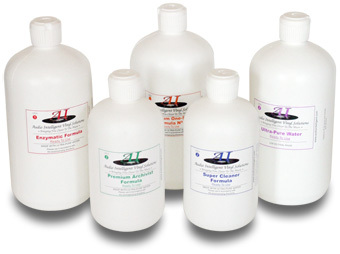 In addition to separate cleaners for vinyl and shellac records, AIVS has a three-product regimen that uses an enzyme-based fluid, a general cleaning fluid, and a water rinse. If this sounds like something you've already read about on SoundStage!, you have a good memory. Lloyd Walker's Prelude Deluxe kit uses similar cleaning products. But there are a couple of distinct advantages to the AIVS system, and I'll discuss these below. The AIVS fluids range in price from $10-$32.50 USD per bottle, depending on product type and size, and they are sold together in kits at a slight discount. While the Walker Audio system includes everything you'll need to clean records (except a record-cleaning machine, which Lloyd Walker considers mandatory), AIVS sells only fluids. You'll have to look elsewhere for cleaning cloths and brushes (I have some suggestions). The first step in the AIVS regimen is the use of the Enzymatic Formula ($18 per 16-ounce bottle), which, as its name implies, uses enzymes. These are effective on water-insoluble and protein-based stains, including mold-release compounds, fingerprints, fungi and bacteria. Of course, there are chemical detergents that can remove these as well, but would you want those on your records, especially in concentrations needed to remove really tough stains? The enzymes replace the detergents and make for a more dilute solution that's better for your records. After the Enzymatic Formula comes either the Super Cleaner Formula or Premium Archivist Formula (both $18 for 16 ounces). The chief difference between them is one ingredient: isopropanol, or isopropyl alcohol, a widely used solvent. Some people believe that it harms vinyl, making it brittle and more susceptible to stylus wear. Others, myself included, apply fluids that use isopropyl alcohol sparingly and leave them on the vinyl for very short periods, thoroughly vacuuming them off instead of blotting them up (and perhaps into the vinyl). I've seen staff in used-record stores use isopropyl alcohol straight out of the bottle to clean LPs. I wouldn't recommend this, but I've bought LPs at used record stores, and generally when they look clean, they sound clean as well. Still, if the idea of putting any alcohol on your LPs is anathema, use the Premium Archivist Formula, which has none. Otherwise, the Super Cleaner Formula is the way to go, and it's what I used. Finally, AIVS recommends finishing up with a water rinse, but not just any water. Its own Ultra-Pure Water ($10 per 16-ounce bottle) is filtered and de-ionized in a six-step process, producing a research-grade fluid. "The result," according to AIVS, "is water that is more than 50 times purer than distilled water." AIVS provides detailed instructions on its website for using the various cleaners; many of us will consider the instructions a starting point, then add our own wrinkles. Most significant is the company's support for cleaning by hand, which is something Walker Audio does not advocate. I followed the AIVS directions and achieved decent results without a record-cleaning machine. Some nappy microfiber cloths I found at Wal-Mart worked pretty well with the fluids -- a different cloth for each fluid -- but the recently introduced Mobile Fidelity record brushes worked far better for spreading the fluid and scrubbing gently into the grooves (I still had to use a cloth to remove the fluids). Loudspeakers  Wilson Audio MAXX Series 2. Power amplifier  Lamm Industries M1.2 Reference and Atma-Sphere MA-2 Mk III monoblocks, Audio Research Reference 110 stereo amplifier. Preamplifier - Audio Research Reference 3, Aurum Acoustics Integris CDP. Analog - Music Hall MMF-5.1SE turntable package, TW Acustic Raven AC turntable, Graham Engineering Phantom B-44 tonearm, Dynavector DRT XV-1s cartridge, Aurum Acoustics Integris CDP phono stage. Interconnects  Shunyata Research Antares Helix, Crystal Cable Ultra, AudioQuest Sky. Speaker cables  Shunyata Research Orion Helix, Crystal Cable Ultra, AudioQuest Volcano. Power cords  Shunyata Research Anaconda and Python (Vx and Alpha variations), Essential Sound Products The Essence Reference. Power conditioner  Shunyata Research Hydra V-Ray, Essential Sound Products The Essence Reference power distributor. Accessories - VPI HW-17 and HW-27 Typhoon record-cleaning machines. However, a machine cleaning afterwards always reduced groove noise, ticks and pops. I applied the Enzyme and Super Cleaner Formulas by hand, using the MoFi brushes to work them in. I vacuumed them off, then finished with an Ultra-Pure Water rinse, which I applied with the applicator of a VPI HW-17 or HW-27, working it in with a separate brush. Used this way, the AIVS fluids produced vinyl that was visually and aurally as clean as it could get, often restoring the inky-black luster of the LPs as well. While the AIVS fluids didn't produce records with greater midrange presence or improved bass definition, as some people inexplicably suggest is possible with certain cleaning fluids, I did think the results were slightly better than with the Walker Prelude system, though I don't know if the difference was attributable to the fluids or the Mobile Fidelity brushes, which I used only with the AIVS fluids. I even constructed a torture test, putting a few oily fingerprints on a dust-covered thrift-store copy of Supertramp's Breakfast in America [A&M SH-3708], and the AIVS fluids removed every stain or speck. The only thing they couldn't eliminate was a fingerprint in brown paint on an original copy of Dexter Gordon's One Flight Up [Blue Note 84176]. Removing that would have been the equivalent of working miracles. In my Walker Audio Prelude review, I pointed out two negatives of this very effective cleaning kit. First, with two applications of cleaning fluids and two rinses per side, each album required about ten minutes of work. Second, at its $135 price, the Walker Prelude isn't cheap and, depending on how you use it, each cleaning might cost $1, which is much more than the thrift stores in my area charge for LPs. The AIVS system requires only one rinse, which cuts down the cleaning time needed by a quarter. In terms of cost, a 16-ounce kit ($38) should clean around 125 records; you can double that for the 32-ounce kit ($68). Of course, you still have to buy brushes, which are included in the Walker Prelude kit. The Mobile Fidelity brushes can run you $60 for three. Even so, the AIVS fluids are clearly more economical, and you will spend less time using them and more time listening. Vinylphiles have intense brand loyalty for the products they use to clean their precious LPs, and I'm no different. I plan to use these AIVS products from this point forward, which makes them literally a Reviewers' Choice. Prices: $10 to $32.50 USD per bottle depending on product and size.